Yes, it’s true…I have “gushing book nerd potential.” I have admitted that I would rather meet authors than celebrities. Books are in my genes; I grew up in a literacy-rich environment. Newspapers, books, magazines…my mother was always telling Dad to stop reading at the dinner table because it was impolite. As a child, I watched my father write sermons; he read Bibles in Greek, Hebrew, German and English. His desk would be piled high with open books. I heard those marvelous sermons every Sunday morning. Reading, writing, speaking — I was surrounded by literacy. As a child living in a small town, my library was my dad’s office. When my family relocated to the suburbs, I was thrilled to have a real, brick-and-mortar library within walking distance. And so, the library is one of my favorite places to take my daughters, as I try to surround them with literacy as well. At our library, the first stop is this bench with a reading duck. There really are words in that book he’s holding! Then, it’s on to say “hi” to the fishies. We brought our little neighbor with us on our last trip to the library. Hello, little fishies! Clifford always needs a hug. He gets a lot of lovin’ from his special friend, Emmy. Did you think our next stop would be the bookshelves? 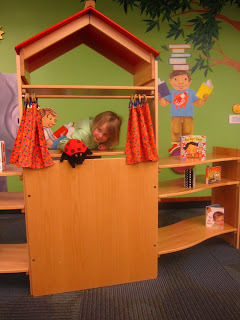 Silly readers, the puppet theatre is always next! 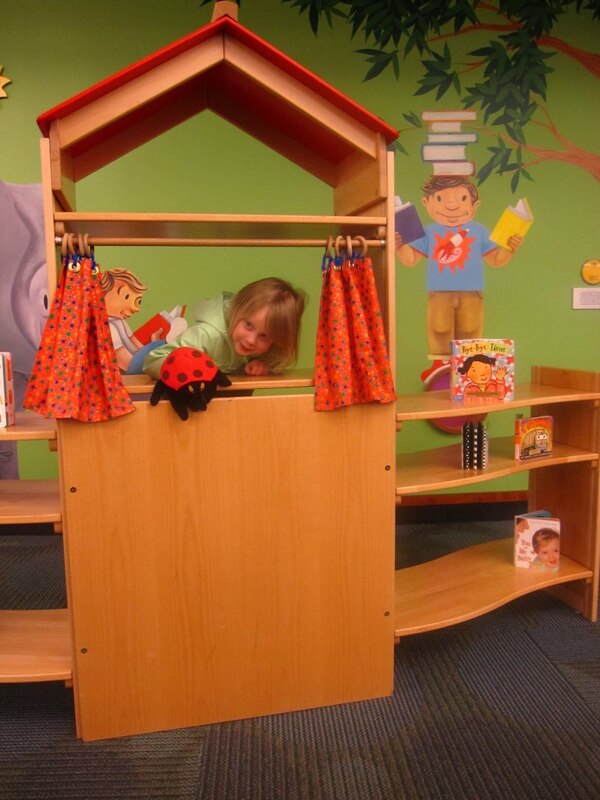 There are puzzles and games, story time and stickers, and so much fun to be had at the library! And yes, eventually we do arrive at the bookshelves to bring home stacks of books! 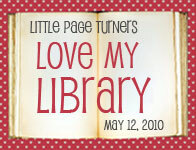 Christianne of Little Page Turners invites us to view her library, and it’s definitely worth the visit! Click on the button below to see their amazing library! How about you? What do you love about your local library? 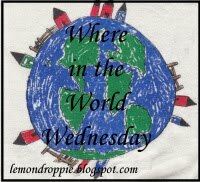 Where in the world are you this Wednesday? Next Wednesday, I’ll be telling you about the places we go! Whether you’ve traveled the globe or have merely gotten lost in a book, I’d love to read about the places you go! Have you documented your kids riding a camel in Egypt or clinging to a carousel horse at the mall? Show off your photos! Then stop by Lemon Drop Pie next Wednesday to leave your link and share your adventures! 21 Responses to Lovin’ Our Local Library! what a nice library.. This kind of creations very good for children.since they love reading books in this type background. It is good for their minds rather than playing stupid computer games. That is an amazing library. I wish it were mine. We have "Two rows" in our little county library. Yes I said two. There is a nice wall mural though and we can request any book we want we just have to wait a few weeks to a month or longer to get it. Im sure its a work in progress… right? 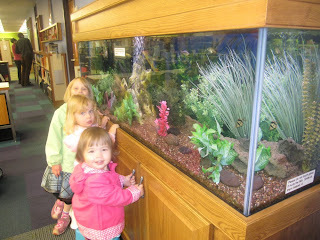 My guy would love fishies at the library! What fun! I have to confess that we stopped going to the library when the mean story time lady got to us. Our kids are total bookworms though, we scoop up every garage sale kids books we can get our hands on and are forever reading stories. Your library sounds great.. I think we'll give ours another try this summer. It's been two years. Your library looks amazing! My daughter would love to hug that Clifford dog! Oh, I heart libraries!! And zowee, that's a very cool one you have. Ours locally are, sigh, only fair. The best one is far enough away that we only go if we're on that side of town for something else — but it is by far the best kids collection around, and a nice atmosphere too. But, hello, a puppet theater?? I wish!! Lucky you — and lucky girls. I haven't been inside a library for years.Yours looks wonderful. Wow, what a wonderful library. I love the puppet theatre. that reading duck is too cute! what a FUN place to go to get lost in a book! I think the reading duck would be our first stop, too! A puppet theater – what fun! And I love the reading duck… does he have a name? My girls would be hanging on Clifford all day long. 🙂 Thanks so much for linking up!!! I spent hours in the library as a child, so I encouraged that same love in my own children. It's a real treasure, isn't it? A small branch of our county library opened up right in our neighborhood a couple of years ago. We love it. It's so close we could walk there (if it wasn't so dang hot lately) and we're always requesting books from the library's main website that we can pick up locally. I never buy books anymore. Since I don't read in Dutch, my local library is not really for me. When I was younger I would get books out regularly though. I've even been known to visit a small Austrian library and take a book out. They were so surprised by a 14-year old Dutch girl reading German! !Nowadays I prefer bookshops. Again not in the Netherlands, but when I'm in London I can be stuck in one for hours, trying to find the most perfect books to bring home! I love the idea that our love for books can be passed on to our children like this. Very fun library! My kids would love the puppet show! I love our library too! We have fishies … love the story hours – they also do an accompanying craft to go along … lots of fun! 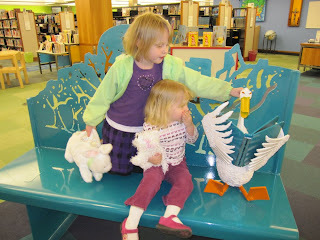 I loved my local library when I was little, as my kids love ours now! I love that everything is set up for how tall kids are, but I still don't like that I feel I have to tell them to be quiet ever few minutes!! Your pictures are so cute!! 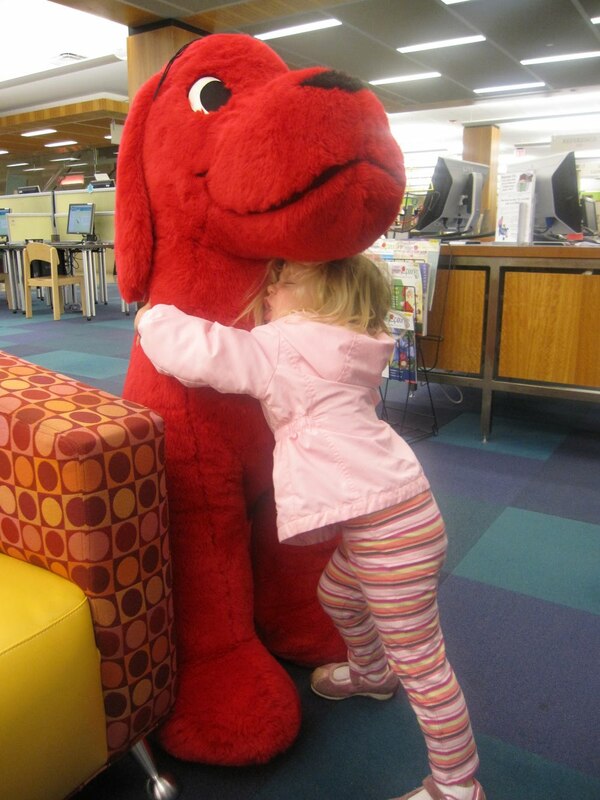 We would hug Clifford like that too, if our library had one! !